Reiki (pronounced ray – ki) is an energy-based alternative healing therapy that originated in Japan. Reiki is a Japanese word: rei – universal and ki – life force. 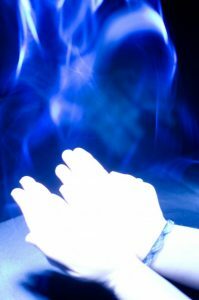 Reiki practitioners are trained to channel the universal life force energy and translate this energy to the level at which the client can receive it. Reiki, as a healing modality, is fascinating and challenging in that it is incredibly powerful and beneﬁcial, yet can also be subtle as it works on the energetic level. It affects all aspects: physical, emotional, mental, and spiritual, and it serves to heal, restore balance, cleanse, and revitalize. It works to clean out negativity and blockages, encourages energetic movement and ﬂow in areas that are stagnant or stuck, it permeates all of our energy systems and realigns what may have gotten out of whack. The beneﬁts of Reiki really are limitless. As an energy-based modality, Reiki is not encumbered by time nor space. Therefore, it can be used to help people without them being physically present. Practitioners are taught to give long distance treatments in higher level Reiki classes. Long distance treatments can actually be more affective for clients. The benefit of long distance work is that the critical mind does not resist the healing energy. Recipients are better able to stay out of their own way. Another wonderful benefit of distance work is that you can receive it anywhere you are and at any time you’d like, day or night. Reiki can also be sent to clean up, support, or heal situations in the past, present, or future. I have had clients want Reiki treatments for everything from an upcoming job interview, to a first date, to family crisis, or even to help a loved one. The Reiki energy works to support the highest good for all involved and can shift things to provide more peace, ease and grace through stress or trauma.